I’m coming up onto my 4th wedding anniversary now (later this week! ), and everything is awesome. I am so grateful and happy that my partner and his family welcome me openly into the fold. Unfortunately, the process of changing one’s name is incredibly administratively tedious…. and expensive! I’ve been slowly changing my name on things over the past few years: my UK driver’s license, all our bills, spammy stuff (tesco clubcards, etc). The last few to do were the hardest: my US passport, and my application for UK citizenship (which would hopefully negate needing to replace/change name on my Residence Permit). I looked into applying for UK citizenship, which seems a generally simple process and could be done one year after I got Indefinite Leave to Remain. This meant skipping out on having to take the Life in the UK test, as I’d passed it recently (for the indefinite leave application). Fortunately, my US passport was about to expire anyhow, so I applied for a new one. This was as simple as completing the application form (DS82) online and posting it, along with my passport, official marriage certificate, passport photo, the $110 fee, and royal mail delivery envelope. And then waiting 4 weeks! I posted the documents on August 25th. Had a wee blip wherein the Consulate accidentally charged my card $800 dollars/£500 quid instead of the $110 fee, so my bank put a hold on my card… But I do love extra administrative processes, don’t I! Sorted in good time and my new fancy passport – with my new name! – arrived on September 12th. Less than a month wait. Painless? Mind, while all this life-admin is going on, I am generally without any identification documents. It’s a very scary feeling – being in a foreign country without your passport. It’s also very boring. You can’t travel. You can’t even *think* about travel… since if you book something, you never know if you might not have your passport back in time. It often takes months to process, so this is months of time when you’re not sure if everything is going smoothly, if your passport has been lost or confiscated or if there’s something missing from your application that means you’ll lose your payment and have to apply and pay again (<– things a worrier worries about). Referee pages: Like a new passport application, I needed to get two referees. These cannot be family members, but need to have known me for ~ 3-5 years. They need to be willing to provide their passport numbers, and their addresses for the past 3-5 years. At least one of them needs to be in ‘professional’ work (so no students, etc). I found this actually quite tricky! I’ve been working my current job for 3 years, but many of my colleagues haven’t worked there/known me for that long (so couldn’t ask anyone at work). A number of friends very kindly offered but don’t live nearby (so would take longer to get the application sent off) or are students or have moved around a lot (so I’d feel bad asking them to recount their addresses). Just a bit tricky actually.. but I saved it for last as it was the most hassle to get filled out. I posted my application on 19 January. I received a letter on 6 February saying they had received my application and had taken the required fee. Although I have had my biometric information (photo, fingerprints, etc) processed a number of times for previous visa applications (and so they should be on record at the UKVI I would think), part of the citizenship application process entailed getting my biometric information taken again. I received the letter (mentioned above) in the post on 6 February, dated 3 February, which said I had 15 days from the date on the letter to get my biometrics information taken. All well and good – (fortunately!) there are two places in Edinburgh to get your biometrics data processed, the closer of which was the Post Office at Princes Street Mall. The Post Office website recommended going on a Tuesday-Friday so as not to have to wait a long period of time. SO, I ran there on my lunch break on Tues, 9 February, and waited around a half an hour to get to the front of the queue to be processed. (Everything is more tiring and takes longer when you’re heavily pregnant, FYI.) I had my photo taken in the special booth, gave my fingers & thumb prints for both hands, signed my name and paid the required fee! Note on name: Obviously I am trying to have my name on my UK citizenship as Aiko Greig (Go Greig! ), but unsettlingly the paperwork for the biometrics application had my maiden name, with the note ‘if you have had your biometrics processed before, this may show your previous name’. …. Fingers crossed everything goes okay! EXCITEMENT! I received a letter on 3 March saying ‘I am pleased to tell you that this application for British citizenship has been approved.’ Woohoo! That was pretty quick! The letter also said I needed to book in for the citizenship ceremony in my area within 21 days (ceremony needs to take place within 3 months from receiving the letter). Obviously I did that immediately. Ceremonies in Edinburgh seem to happen every fortnight or so, but with me about to finish up work for maternity leave, I couldn’t attend the first available ceremony (so in theory I could have been done 2 weeks faster!). I booked in instead for the ceremony on April 5th. The citizenship ceremony is *very* brief. Maybe 30mins or so long. You’re required to say either the Oath or Affirmation of Allegiance, including your name, and the Pledge. This is done in a group ceremony with other people also reading the oath/affirmation at the same time. You can bring up to 2 guests. The room at the Registrars was pretty big and full of soon-to-be citizens and their guests. Lots of babies crying and folk trying to take photos (not allowed by the way!) and the Lord Provost and a lady from the Registry do a welcome and introduce everyone. Photos are taken by a photographer of us receiving our Naturalisation Certificate (we can pay for these after…). It was all very ceremonious! I, (name), swear by Almighty God that, on becoming a British citizen, I will be faithful and bear true allegiance to Her Majesty Queen Elizabeth the Second, Her Heirs and Successors, according to law. I, (name), do solemnly, sincerely and truly declare and affirm that on becoming a British Citizen, I will be faithful and bear true allegiance to her Majesty Queen Elizabeth the Second, her Heirs and Successors, according to law. So that’s done! Dual citizenship! WELL! Imagine my disappointment when I realised that getting UK Citizenship did not automatically mean I got a UK passport. You needn’t imagine actually. I was/am very disappointed. So after all that – the £1005 app fee and all the time waiting and faffing about, I wasn’t even getting a passport! I’d have to do YET MORE admin! Gutted. Fortunately (?) the form for this could be completed online. I filled it out quicksmart and paid the required fee. I needed to get it countersigned by someone (so that’s, as above, me finding someone who is not a family member, but who has known me for 3+ years, to put on paper that I am me. EVEN THOUGH I had just very recently done this EXACT thing for the naturalisation paperwork….). I posted the form and the required documents out on 12 April. The supporting documents were returned to me the following week by special delivery person. A letter came in the post the same day to say I’d need to come for an interview to check my identity, for which I’d need to book in. I arranged this interview for the 25th April, and I got my new shiny beloved UK passport on Thursday, 28 April! Let the travel adventures begin! All that admin took ~9 months and cost around £1200. Perhaps it was a bit of a novelty since I’d already had Indefinite Leave, but am pleased to be done changing fully to ‘Greig’! Tidy life! I started my mentorship with WN Herbert. So far so good! Need to get my ducks in a row, work on a proper writing routine that’ll maximise productivity (esp this year) and get the makings of this pamphlet sent to him for review. I started my maternity leave! Blessed time to ‘rest’ before the big day. Obviously I am filling it full of activities because I cannot sit still. Booked our trip to Arran! Booked our trip to Portugal! My mom has booked her flights to Scotland! I had my baby 10 days early! In 6 hours. So glad it all went smoothly. Now, to take care of a baby! OMG they let us have a baby. It’s been a sad/busy month for the hens: Winnie laid some eggs. She’s holding the fort down as Fran & Henry have given up on their egg-laying duties. Dearest Henry the chicken was taken by a fox at the end of March. This is the saddest news. Easter Monday she was gobbled up mid-coop-cleaning. S was in a state (as he was the coop cleaner on duty and I was at work), but we are okay now. Poor Winnie & Fran seem forlorn. Then less than a month later, we found Fran in the coop, legs up. So so sad… So that just left Winnie on her own. Hens are flock animals so it was sad to see her on her own so lonely and bored. We contacted Wing and a Prayer who put out a call for her to get rehomed and someone came the same day to adopt her. We’re so sad to lose all our amazing hens… so sad… but it was the right thing to do to get her adopted. And we’ll look into filling our coop with new friends next year. And audiobooked Ready Player One (Ernest Cline), Art of Asking (Amanda Palmer), and caught up on the Serial podcast (season 2). 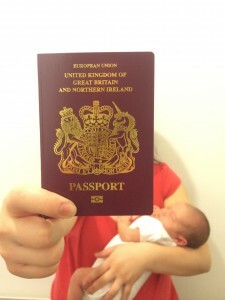 Now to get my small person a passport so we can FLY!